The New York State Broadcasters Association, Inc. (NYSBA) has selected “World News Tonight” Anchor David Muir as its 2018 Broadcaster of the Year. A multiple Emmy and Edward R. Murrow award-winning journalist, Muir has covered the most important stories of our time. He has reported from Tehran, Mogadishu, Gaza, Jerusalem, Fukushima, Guantanamo Bay, Amman, the Syria border, Beijing and the Vatican. Muir spent a year reporting on the heroin epidemic for a primetime special and has reported from the field on the plight of Syrian refugees. His early reporting from inside the Superdome shed light on the horrific conditions in New Orleans in the aftermath of Hurricane Katrina. His interviews with newsmakers generate global headlines landing the first interview with President Donald Trump in the White House, the only interview with President Obama in Cuba, the exclusive interview with Pope Frances in Spanish, and the interview with Hillary Clinton during which she apologized to the American people over her e-mails. A native of Syracuse and graduate of the Park School of Communications at Ithaca College, he began his career in his home town at WTVH-TV where he began interning at 13, before moving on to WCVB-TV in Boston. He has been with ABC News since 2003, and served as the anchor for the overnight news program World News Now and a network correspondent. In 2011 he began anchoring the weekend edition of World News Tonight. 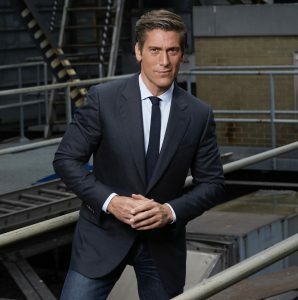 On September 2, 2014 he became the sole anchor and managing editor of ABC’s World News Tonight with David Muir. Mr. Muir will be honored at the New York State Leadership and Hall of Fame Luncheon on October 18th at the Javits Center in NY City. The luncheon is held in conjunction with the NAB Show NY and will also honor the new inductees, Michael Kay, Dave Davis, Doug Emblidge, Ginny Ryan and Dan Ingram into the NY Broadcasters Hall of Fame. You may register for the luncheon on the NAB Show New York by clicking HERE.